This device is an Abbe Refractometer. A liquid sample or transparent solid can be placed between two prisms - a refracting prism below the sample, and an illuminating prism that is mounted above the sample. This entire system is rotatable, and is attached to a secondary eyepiece that allows for the reading of the angle of the device. This angle is used when determining the refractive index of the sample, and most devices will instead list the angle in terms of the corresponding refractive index (n=1.1, n=1.2, n=1.3, etc). This refractometer is able to measure a refractive index from 1.46 to 1.86 at a precision of ±0.0002. The system is also contained within a water jacket to allow for temperature variation by pumping water through to cool the prisms. The refracting prism was often of a very high refractive index, as the device is designed to measure the refractive index of samples less than that of the refracting prism. The illuminating prism also has a rough-ground base, so that when white light enters the device it is scattered at all possible angles. The light then travels through the interface between the sample and the refracting prism, and is refracted at some angle, with the angle depending on the sample. The upper refracting prism, as it is an Abbe prism, has a special property. It is designed in such a way that a specific wavelength of light always exits the prism at an angle of 60° and all other wavelengths of light exit at larger angles. This means that for angles less than 60° there is only a black band where no light passes through the prism. The user of the Abbe refractometer thus sees a boundary between the dark and light region, and is able to rotate the internal prisms until this boundary is aligned with a marker on the eyepiece. The user then reads the refractive index from the secondary eyepiece to find the refractive index of the tested material. Under white light illumination, dispersion by the prisms and the sample causes blurring of this light/dark boundary and thus limits measurement precision. To eliminate dispersion, the refractometer is furnished with a compensator consisting of two equal Amici prisms within the eyepiece cylinder, which may be rotated uniformly in opposite directions around the optical axis. The water jacket that encloses the system allows for finer measurement by varying the temperature of the sample as some liquids have refractive indices that vary significantly with temperature. In order to correctly measure at temperatures other than the calibration temperature, the user could refer to a table of values that originally came with the refractometer. 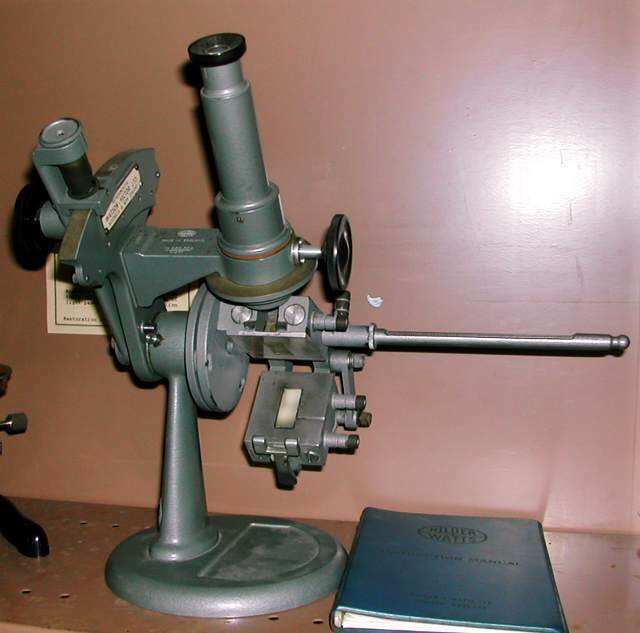 This kind of refractometer was designed by Ernst Abbe in 1869 as part of his work with Carl Zeiss, a German optical instrument maker. Abbe is also famed for the development of the numerical aperture formula for microscopes and for the prism which bears his name. Two such Abbe prisms are the key components of this refractometer. This instrument previously formed part of the collection housed in The University of Queensland’s microscope repair department. Prior to that, it may have been used in the entomology department Abbe refractometers such as this one have been most widely used in quality control testing, especially of comestible substances, where knowledge of refractive index permits determination, for example, of the concentration of sugar in a sample, or of solids in milk. They have the significant advantage of requiring only a drop or two of sample solution in order to yield a very accurate measure of refractive index. Hecht, Eugene. Optics. 3rd ed: Addison Wesley Longman, 1998. Turner, Gerard L'E. Nineteenth-Century Scientific Instruments. London: Sotheby Publications, 1983. Hilger History: The Hilger Story... So Far !!!! 2005. Hilger Crystals, A Newport Company.